When it comes to fitness, no two workouts are created equal. Cardio is an important part of every physical fitness program, but it's important to remember that individuals must vary their workouts to continue to increase their aerobic capacity and endurance. Two of the greatest cardio exercises are burpees and running, both of which should be integrated into your fitness routine. Fitness experts believe that "superior exercise" is a subjective term and that the burpee and the sprint have their own benefits. Both burpees and running sprints burn fat, increase muscle tone, work core strength, exercise anaerobic thresholds, and have a high post-exercise oxygen consumption intake. The burpee is performed when you place your hands on the ground in front of your feet. Then, jump your feet back behind you so that your body is in a push-up position with your abdominals engaged. Lower your body down to the floor so that your chest touches the ground completely. Then, push your body away from the ground in a push-up position and bring your feet to your hands. Lastly, jump up off of the ground, fully extending your body and clapping your hands overhead. 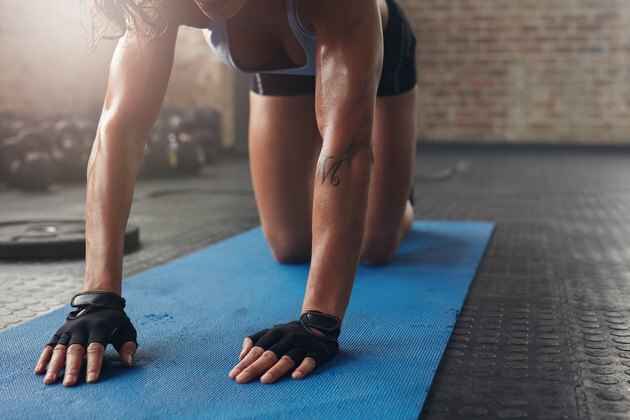 According to an interview in The New York Times, Martin Gibala of McMaster University in Hamilton, Ontario, says the burpee stands out from the pack as the best exercise to perform. Gibala notes, "It builds muscles. It builds endurance," proving that this exercise is a superior exercise amongst physical fitness experts. The burpee is a full-body movement that incorporates cardiovascular training, core exercise and muscular development. As compared to running, which emphasizes the lower body, the burpee requires the arms, core, legs, glutes and cardiovascular system to all work in one movement. Running is a great way to increase both your aerobic and anaerobic thresholds. As a proven way to lose weight, running can also increase your VO2 Max and sculpt lean muscle. A VO2 max is a major physiological marker in the amount of oxygen you can intake at any given time vs. the amount of lactic acid your body builds during exercise. One of the most efficient ways to lose weight and chisel muscle by running is through sprints and high-intensity intervals . High-intensity intermittent exercise has been proven to be more effective than steady state cardio at reducing dangerous types of fat such as subcutaneous fat and abdominal fat. 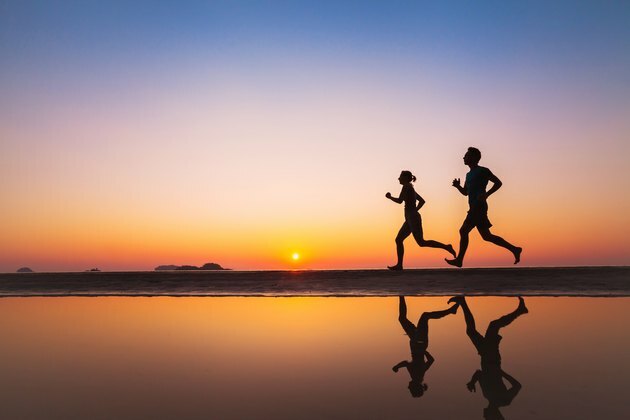 In a study performed by the International Journal of Sports Nutrition and Exercise Metabolism in 2012, "two minutes of sprint-interval exercise elicits 24-hour oxygen consumption similar to that of continuous endurance exercise." The study researched the difference between the oxygen consumption after a 2-minute sprint and after 30 minutes of steady state cardio. The more oxygen consumed during and post-exercise will increase the net number of calories expended. Therefore, if you complete running intervals or burpees at a sprint-interval pace, you will burn more calories post-exercise than steady state cardio like long-distance running. Burpees and running are two exercises that can be performed almost anywhere in the world and without the need for a gym. Try integrating both running and burpees into your workouts with varied intensity, repetitions, and time. You can perform workouts that involve high numbers of burpees such as in CrossFit workouts where they ask 100 or more burpees in one round, however burpees are usually not utilized as steady-state cardio. For workouts, try performing a tabata of 8 sets of 20 seconds of work and 10 seconds of rest with both burpees and sprints. As another option, try performing five rounds of 30 seconds of intense burpees or sprints and 30 seconds of rest. Play around with the time "on" and time "off" to vary your workouts. International Journal of Sports Nutrition and Exercise Metabolism: Two minutes of sprint-interval exercise elicits 24-hr oxygen consumption similar to that of 30 min of continuous endurance exercise. New York Times: What’s the Single Best Exercise?